I admit it, I was wrong. 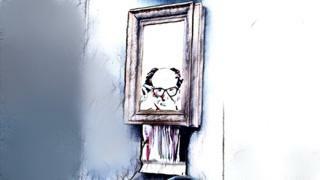 When I said a couple of weeks ago that for the past century artists have failed to outwit and outdo Marcel Duchamp (the French conceptual artist who placed a urinal in a gallery in 1917), I hadn't realised that there was an artwork hanging on the walls of a London auction house which was about to do just that. That "moment" at Sotheby's the other day when Banksy's Girl with Balloon sold for £860,000 (just over £1m with add-ons) and promptly self-destructed in front of a gobsmacked auction room was a match for any of Duchamp's mischievously ironic artworks. 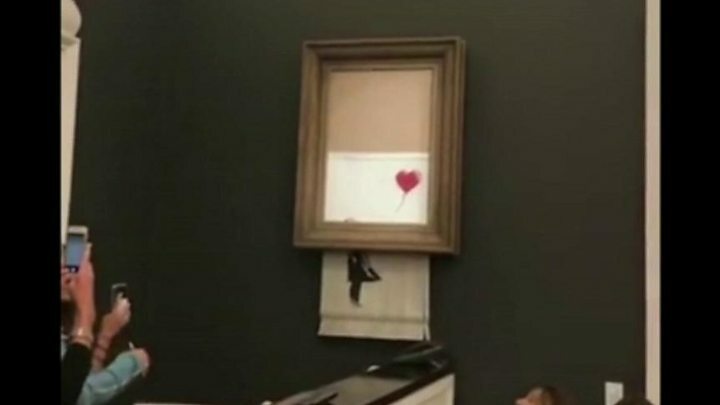 Before our very eyes, the familiar Banksy image of the girl with a balloon, for which an unnamed lady paid an unfathomably large sum, was transformed into an entirely new piece, retrospectively titled by the artist, Love is in the Bin. "At first I was shocked," said the winning bidder and proud owner having decided to keep the work, "but I realised I would end up with my own piece of art history." The idea of destroying one artwork to make another has turned into something of a genre post-Duchamp, who was the past master of the art stunt. In 1953, for example, Robert Rauschenberg famously rubbed out a drawing given to him by the revered Dutch artist Willem de Kooning. The American then spent two months obliterating the original image before mounting the now blank sheet of paper in a gilded frame, onto which his friend Jasper Johns inscribed with the words, Erased de Kooning Drawing. Robert Rauschenberg. In light of which, and for the sake of clarity, the subject of this review is not a 2006 Banksy canvas in a mock Victorian frame, but the new artwork made by the artist via a remote control device live in the auction room on 5th October 2018. The one with shredded canvas hanging from the bottom of the frame, which is on display at Sotheby's, London throughout the weekend. This is what I think about Love is in the Bin. It will come to be seen as one of the most significant artworks of the early 21st Century. It is not a great painting that can be compared to a late Rembrandt, or a sculpture to sit alongside Michelangelo's David, but in terms of conceptual art emanating from Duchamp's Dadaist sensibility, it is exceptional. It was brilliant in both conception and execution. Take its initial creation, which was a stunning piece of site-specific, mechanically-aided, performance art; an attention-grabbing spectacle taking place within an attention-grabbing spectacle, which highlighted through dark satire how art has become an investment commodity to be auctioned off to ultra-wealthy trophy-hunters. As an action, it was reminiscent of the K Foundation's spectacle of burning a million pounds on the Isle of Jura in 1994. The difference here was the one million pound object Banksy destroyed could quite possibly be worth more, which, when you think about it, tells you all you need to know about a cynical art world and its values. Imagine you'd saved up all your money to buy a painting you truly loved and then at the very moment you were about to take it home someone came along and shredded it. Would you want your money back? Sure you would, you loved that piece. But contemporary art is not valued for its inherent aesthetic qualities (although that is how it is presented to us), it is valued pretty much solely on the basis of an artist's reputation. All that matters is the brand, that it is a Banksy, or a Koons, or a Kusama. For a lot of collectors art has become an asset class. Hence the talk after the event wasn't about art but the asset. Will the shredded work be worth more, or less? Surreptitious calls were made suggesting potential buyers were already lining up to purchase it, should it come back on the market. Speculation mounted. Maybe the whole thing was an elaborate prank by Banksy. He could have put the piece up for auction through an associate and then bought it for the staggering sum of £1m knowing full well the sale wouldn't go through because the work was about to be destroyed. You wouldn't put that past him, would you? And what about the shredder? Were Sotheby's in on it? If not, just how bad is its security not to spot an inbuilt metal contraption with (I assume) a remote control device installed? Image caption Why didn't Sotheby's security detect a metal contraption in the artwork? Duchamp would have loved it all. The provocation, the mystery (he signed his urinal R Mutt to hide his identity), the creation through destruction (he drew a goatee onto a postcard of the Mona Lisa to create an original artwork), the challenging question about the nature of art. What is Love is in the Bin? Is it a painting? Or, is it now a piece of conceptual art? Or should it be classified as a sculpture? Or is it rubbish? Duchamp would say it is up to you to decide. My view? It is art. Made by an artist who many don't rate but I do. Why? Because he has something to say. You might not agree with him, but at least he is making art that penetrates the public consciousness; art that is in the world, not detached from it; art that raises questions that need an airing. Banksy makes art that, as Hamlet said, holds "…the mirror up to nature: to show virtue her feature, scorn her own image, and the very age and body of the time his form and pressure." And what artwork better captures the spirit of our times than Love is in the Bin? I can't think of one.